Tucked away in the pages of Reformation history lies the figure of Johann von Staupitz. He served as Martin Luther’s superior within the Augustinian Order and importantly also as his father confessor during the first decade of the 1500s. Even though he remains a shadowy figure on the outskirts of Luther’s life, it is hard to imagine the Reformation without him. It is for this reason that he is commemorated within our saints-calendar on November 8 every year. Born sometime between 1460 and 1469 in Motterwitz, Staupitz grew up as a childhood friend of Frederick the Wise, the man who would later become Elector of Saxony as well as Luther’s prince and benefactor. We know little about Stauptiz’s origins except that he was descended from Czech nobility—a fact which likely contributed to the direction of his later monastic career. From 1483 onwards, he studied Liberal Arts along the theological system of Thomas Aquinas in both Leipzig and Cologne, eventually receiving his Master of Arts in 1489. He then travelled to Munich were he began his monastic career as a member of the Augustinian Order. In 1497, however, Staupitz left Munich for further studies at the University of Tübingen, where he eventually earned a doctorate in theology by 1500. Having been exposed to the various—and often, contradictory—schools of theological thought current within the medieval church, Staupitz found himself driven to the teachings of an earlier age as presented and defined by St. Augustine. This led him to re-evaluate many teachings and practices of the medieval church, returning to a time when theology was rooted in the study of Scripture and an evangelical concern for pastoral care. Given this background, it is no surprise that Staupitz quickly rose to positions of leadership within the Augustinian Order. From 1500-1502, he served as Prior at the Munich cloister until Duke Frederick invited him to move to Wittenberg and become Professor of Biblical Studies and Dean of Theology at his newly established university. This position was not to last; within a year, Staupitz was named Vicar-General of the Reformed branch of the Augustinian Order. This group, while still part of the larger Augustinian Order, was locked in an internal dispute over governance and discipline within the Augustinian Order. The Reformed (or Observants, as they were called) advocated a stricter form of discipline and a closer reading of St. Augustine’s theology. It was, incidentally, this Reformed branch of Augustinians which Luther joined when he entered the Black Cloister in Erfurt on July 17, 1505. It was in this context that Luther became acquainted with Staupitz. As Luther’s superior and father confessor, Staupitz saw Luther through some of the darkest moments of his spiritual trials. Reflecting back on this time, Luther wrote: “If it had not been for Dr. Staupitz, I would have sunk in hell.” In fact, Luther credited Staupitz with introducing him to the Gospel—a discovery which would lead eventually to the Reformation. Staupitz saw great promise in Luther and encouraged him to return to his university studies in order to earn his doctorate. He eventually recommended Luther as a suitable replacement for his own position as professor of bible and theology at the University of Wittenberg. Following the posting of the 95 Theses, however, Staupitz found himself thrust into the position of having to mediate the conflict between Luther and Rome. 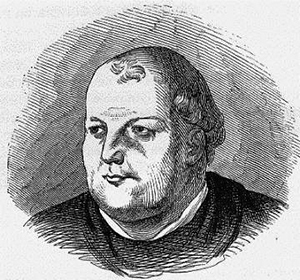 When it became apparent that Rome’s only interest was to silence Luther and the Reformation, Staupitz released the young Reformer from his monastic vows, allowing him to continue his work and calling. Staupitz resigned as Vicar-General of the Augustinian order in 1520 and received a papal dispensation to leave the Augustinians and enter the Benedictine Monastery of St. Peter’s in Salzburg. There he became Prior in 1522, dying just two years later. Luther maintained a deep debt of gratitude to Staupitz throughout his life. And while he questioned Stauptiz’s decision to distance himself from the Reformation, the two remained close friends. In Staupitz’s final letter to Luther, just months before his own death in 1524, Staupitz compared his love for Luther to that shared by David and Jonathan (2 Samuel 1:26). While thanking Luther for his labours to restore the Gospel to the Church, he also expressed his concerns that Luther may have gone too far. Whether this was Stauptiz’s true convictions or a result of political pressure is difficult to determine. We do know that Staupitz’ involvement with Luther and the Reformation remained a concern to Roman Catholics even after his death. In 1559, Pope Paul IV added his writings to the Roman Catholic Church’s list of prohibited books. Without Staupitz, the Reformation might never have happened—and for this, we remember him with thanks and gratitude to God.